Sarah is a founding member of Squishface Comics Studio. She self-publishes zines and mini-comics and is currently working on a graphic novel about Dame Enid Lyons. Sarah is the cartooning tutor at Box Hill Community Arts Centre and the graphic novels tutor at the Centre for Adult Education, Melbourne. Sarah’s workshops are inspired by improvised theatre story generating exercises, combined with strong drawing principles to prompt the creation of comics that build on the individual’s strengths. 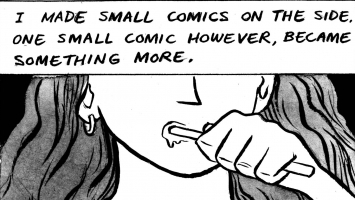 Sarah’s workshops include: ‘Make a Mini-Comic’ and ‘Introduction to Graphic Novels’. She also does interactive live drawing performances. Sarah is also open to collaborating with student wellbeing coordinators and youth workers.